On the way to theanyspacewhatever, the Guggenheim Relational Aesthetics show, I meet mariachis on the subway between 77th and 86th. Maurizio Cattelan’s “Daddy Daddy” — drowned yet floating (because wooden? Then how’d he drown?) Pinocchio — makes it all worthwhile immediately. Father of 4-year-old girl turns it into an object lesson about the importance of lifejackets. 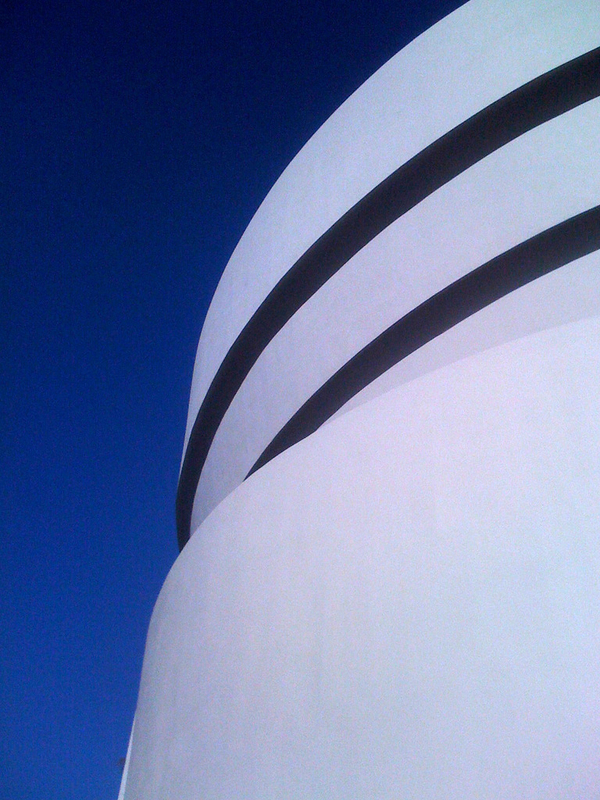 The Guggenheim is a lot of things, but it is pretty clearly not anyspacewhatever. Whatever. Rirkrit Tiravanjia, “Chew the Fat.” Sitting here watching TV on the museum’s temporarily carpeted floor, watching TV. My shoes are around the corner, under a bench. Would be even better if they weren’t there when I went back for them. Shoes are still there. Oh well. Giant press-on text on every surface and hanging signs mostly banal. Should have hired a poet. Dominique Gonzalez-Foerster, “Promenade.” Sound environment. Only part of the gallery where people walk slowly. Sound is of a downpour in a forest somewhere. It’s pretty, but the best part is the people wearing audioguides are completely oblivious to it. Jorge Pardo, “Sculpture Ink.” Cardboard dividers with holes jigsawed out, amphibian-shaped lights. The works of a giant mechanical wristwatch. Slows down the passage. Of time. Douglas Gordon and Rirkrit Tiravanjia, “Bar.” Barista with 3 espresso machines pulling coffees for people sitting on beanbag chairs, watching movies previously banned in the US. Audience mesmerised by Tod Browning’s Freaks. Gabba Gabba Hey. Carsten Holler’s “Revolving Hotel Room” looks like Christian should be living in it. Gentle sway of clotheshangers the only visible indication of its slow rotations. The guards, who are utterly oblivious of people, me included, talking on cell phones and snapping photos throughout the gallery, point out this sign to me right when I try to take a picture of the hygrometer at the end of the ramp. I always liked the hygrometers best.